Millions of pensioners are still paying off their mortgages well into retirement, a study found. One in seven over 70s and a third of over 50s are still paying off a home loan – eating into their pension savings. 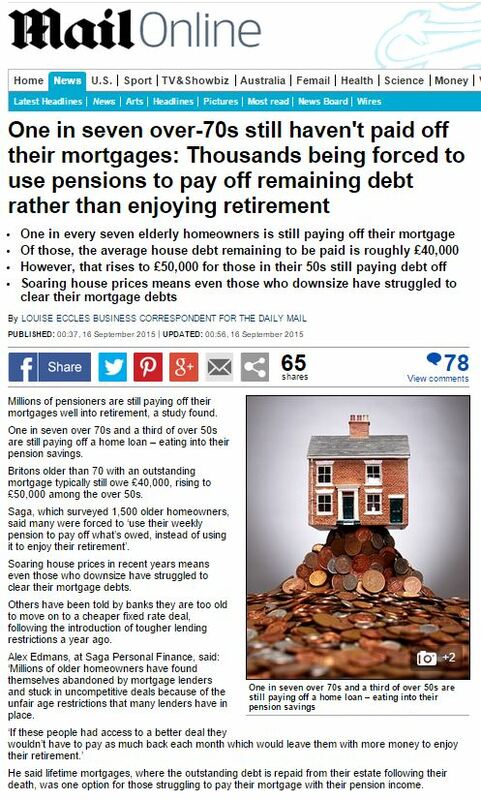 Britons older than 70 with an outstanding mortgage typically still owe £40,000, rising to £50,000 among the over 50s. Saga, which surveyed 1,500 older homeowners, said many were forced to ‘use their weekly pension to pay off what’s owed, instead of using it to enjoy their retirement’. Alex Edmans, at Saga Personal Finance, said: ‘Millions of older homeowners have found themselves abandoned by mortgage lenders and stuck in uncompetitive deals because of the unfair age restrictions that many lenders have in place. ‘For those in retirement struggling to meet their monthly mortgage costs it may be worth considering a lifetime mortgage to help ease the burden of the monthly repayments’, he said. And that’s where the specialist advisers at Saga Personal Finance presumably come in, naturally. This entry was posted in Saga and tagged Alex Edmans, daily mail, Louise Eccles, saga on October 12, 2015 by Michael Marshall.